An important part of interior care is keeping it clean; however, one cleaning product will not do an adequate job for every material used in your interior. 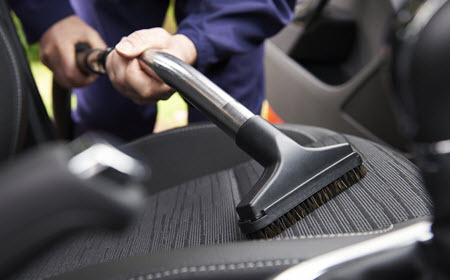 For instance, you wouldn’t use a leather cleaner to clean a fabric seat, or glass cleaner to clean a leather gear selector. In other words, use an appropriate cleaning product that is designated for the material you’re cleaning. Taking short cuts to clean your car and using glass cleaner for the entire interior can cause permanent damage, causing parts of your interior to crack or deteriorate quicker—especially when left in direct sunlight. Keeping your car parked in direct sunlight on a regular basis can have harmful effects on the interior. Fabric seats can deteriorate more quickly, and leather or vinyl components can become worn and begin to crack. Avoiding the sun’s harmful rays is important on an everyday basis, so your best bet is to park your car under a car port or in a garage. If your car will be sitting for a period of time, it’s best to keep it covered. Furthermore, avoid parking in the sun after applying cleaning products to the interior—chemical reactions that occur under UV light can speed up the aging process of most interior materials. Two of the fastest ways to depreciate your car’s value is to smoke in your car or eat in your car. Smoking permeates all the surfaces and materials in your vehicle—primarily when done on a regular basis. When prospective buyers can smell smoke in your car as if you just lit a cigarette, the value is immediately dropped. Eating in your car is usually a death sentence for fabric seats. Having a “no-food” rule in your car is a great way to avoid spills and greasy French-fry stains (we’re all guilty of it at one time or another). So, plan ahead and eat a snack before that long commute in the morning, or have a cigarette before you hit the road, not during. Most interior imperfections can be avoided with proper interior care. However, if you do encounter rips, tears, stains, or cracking in any of the interior components of your car, you should have them looked at by a professional immediately. Tears can grow larger; cracks can expand; and stains can become permanent—it is critical to address any imperfections before they get worse. You can bring your car to an interior specialist, or you can ask a trusted automotive shop for more information about who you can bring your car to for interior care and cleaning. Tech Plus Automotive experts, serving the areas of Scottsdale, Phoenix, Paradise Valley, and McCormick Ranch, AZ, are carefully selected to be a part of our staff because they have special qualities that lend to our philosophies on customer service. Every individual you encounter at our shop is here for the right reasons: a passion for European imports and genuine concern for our clientele’s best interest. The interior of your car requires attention and care just as the engine components do—at Tech Plus Automotive we can help streamline your auto care in just one visit. Contact us for more information about our pricing and available services, or you can schedule an appointment online. We look forward to earning your trust and delivering your satisfaction.